We provide cutting-edge treatment and education in new and innovative ways to reduce fracture risk and improve quality of life. Osteoporosis is a condition of decreased bone strength that increases a person’s risk for fracture (breaking a bone). One in four women over the age of 50 suffers from osteoporosis but this condition can affect anyone. In 1994, we launched Canada's first Multidisciplinary Osteoporosis Program. Today, we are leading experts in the management and treatment of this condition. We take a holistic approach to bone health with our multidisciplinary team which includes: physicians, clinical nurse specialist, pharmacist, physical therapist, occupational therapist, registered dietitian and bone densitometry technologists. Visit the Our Team tab learn more about our allied health members. Welcome to the Centre for Osteoporosis & Bone Health! To be referred to this program you will need to have a bone mineral density test performed. 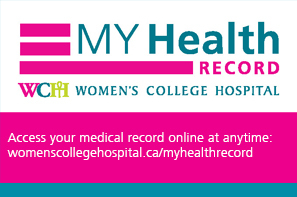 This test can be performed at Women’s College Hospital. Please see the Tests tab for more information, and for the referral form. Once a completed referral has been received, you will be notified of an appointment date and time by a member of our administrative staff. Please remember to bring your Ontario Health Cardopens in a new window with you to this appointment. Please Note: If you do not have a valid Ontario Health Card, you will be required to pay directly for the clinical service(s) provided at the time of your visit. Details are available from any of our program secretaries. Remember to bring a list of your medications including any vitamin or mineral supplements and herbal remedies. You will be assessed by a Multidisciplinary Osteoporosis Allied Health team member; there is also a pharmacist available if necessary to discuss your medication options. You may be asked to complete some blood work or have an X-ray of your spine at the conclusion of your appointment. These tests can be done at the hospital right after your appointment (usually there is no preparation for these tests). If you are unable to keep your appointment, please notify the program scheduling secretary at 416-323-2663 to cancel and/or re-schedule your appointment. Athletic therapy is a profession specializing in the assessment, prevention, immediate care, and reconditioning of musculoskeletal injuries. Our certified athletic therapist is also Bonefit Trained and is now offering education classes on safe and fun exercise for patients with lowered bone density. This is a one-time class offered for one hour several times per month. Our Bone Densitometry technologists are all Medical Radiation Technologists (M.R.T.) that have specialized in Bone Densitometry and have all been certified by the International Society for Clinical Densitometry (ISCD). They provide the highest quality of testing in BMD. They have a comprehensive quality assurance program in place to assess the machines stability as well as the technologist’s technique. The patients are given a BMD questionnaire that is reviewed by the technologists prior to being scanned. The technologists will also assess the patients to determine the appropriate site(s) for scanning. Please visit our Test tab to learn more about BMD testing. The Clinical Nurse Specialist plays an important role in the coordination of patient care as the liaison between patients, physicians and other health care professionals. The CNS is involved in patient education on osteoporosis management and links patients to resources in their communities. In this advanced practice role, the CNS can provide ongoing assessment, advice and support for patients and their families. The pharmacist plays an important role in helping patients make a more informed decision on the medication options used for the treatment of osteoporosis. Patients receive counseling and education on how medications work, their safety and effectiveness, and potential side effects. Individualized assessment is provided to address potential drug interactions, to optimize medication adherence, and to facilitate financial assistance when needed. The physicians specialize in a wide variety of disciplines, including endocrinology, rheumatology general internal medicine, and women's health. Women’s College hospital offers Bone Mineral Density tests using dual energy X-ray absorptiometry (DXA). For health professionals interested in referring a patient for a BMD Test, please complete a BMD Appointment Referral Form. For patients scheduled to have a BMD test, please fill out the BMD Questionnaire and bring it to your appointment. determine your rate of bone loss or monitor the effects of treatment. A bone density scan requires little preparation. You may eat normally and take medications as prescribed by your doctor the morning of your test. However, we advise that patients do not take any calcium tablets on the day of the test. If a calcium tablet is taken just before the BMD test it may not be fully dissolved and may affect the results. Clothing with no zippers or metal buttons are recommended. The actual procedure only takes a few minutes to complete. Below are the referral forms and questionnaires for the services provided by the Centre for Osteoporosis & Bone Health. A physician or nurse practitioner's referral is required. As part of the Ontario Osteoporosis Strategy, Osteoporosis Canada and Women’s College Hospital have collaborated on the development of an interprofessional education series presented via telemedicine.